Very quiet in the bushes but there was a trickle of passage overhead with a Green Sandpiper, a Turnstone, 45 Swifts and a Grey Wagtail of note whilst three Sanderlings and a Redshank flew west offshore. Three juvenile Mediterranean Gulls and a juvenile Yellow-legged Gull were feeding at the Patch. Eight Porpoises and two Grey Seals were feeding offshore. 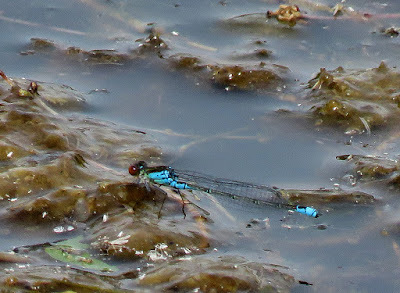 Four Small Red-eyed Damselfly were found at the Long Pits where a Red-eared Terrapin was also seen again.